For the 24 hours to 23:00 GMT, the USD rose 0.75% against the CAD and closed at 1.3360. The Canadian dollar fell against the US dollar, following dovish remarks by the Bank of Canada (BoC) during its monetary policy decision. The BoC maintained its key interest rate unchanged at 1.75%, as widely expected, amid slowdown in the economic growth momentum. However, the central bank backed away from its October guidance to step up the pace at which it raises interest rates in 2019. As a result, the bank now expects to gradually raise interest rate until it reaches a level between 2.5% and 3.5%. In the Asian session, at GMT0400, the pair is trading at 1.3404, with the USD trading 0.33% higher against the CAD from yesterday’s close. 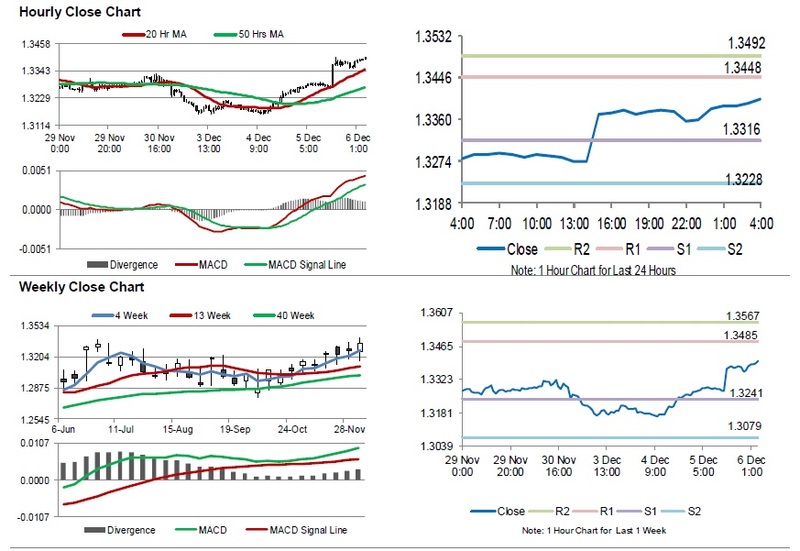 The pair is expected to find support at 1.3316, and a fall through could take it to the next support level of 1.3228. The pair is expected to find its first resistance at 1.3448, and a rise through could take it to the next resistance level of 1.3492. Trading trend in the Loonie today is expected to be determined by Canada’s Ivey purchasing managers index for November and merchandise trade balance data for October, slated to release later in the day.